We’d love your help. Let us know what’s wrong with this preview of Wall Street Kitchen by Victor Chiu. A multi-genre book by author Victor Chiu combines sound business analysis provided by his mother, along with some down-to-Earth delicious recipes written in a slightly whimsical yet fundamentally educating style. Mrs. Chiu, an autodidact, gained experience with stock market investing and enjoyed sharing her revelations with her son, along with the latest delicacies from her A multi-genre book by author Victor Chiu combines sound business analysis provided by his mother, along with some down-to-Earth delicious recipes written in a slightly whimsical yet fundamentally educating style. Mrs. Chiu, an autodidact, gained experience with stock market investing and enjoyed sharing her revelations with her son, along with the latest delicacies from her kitchen. The combination of good advice coupled with savory meals made for a persona of a person which shaped Victor Chiu's life in extraordinary ways. His book celebrates the wisdom gain from his mother in which he shares with his readers, and fortunately at the end of the book are included recipes for the food so temptingly described. To ask other readers questions about Wall Street Kitchen, please sign up. The narrative makes you believe you are actually at Victor Chu's mom's kitchen table sharing some food and talking about investing. The use of informal, every day language makes it very comfortable to read. By relating investing subjects to food and cooking, it brings cognitive ease to this otherwise complex subject. Another nice thing is that there's a box at the end of each "visit" (chapter) with the most important points discussed. It also asks you to do some homework, simple tasks that can h The narrative makes you believe you are actually at Victor Chu's mom's kitchen table sharing some food and talking about investing. The use of informal, every day language makes it very comfortable to read. By relating investing subjects to food and cooking, it brings cognitive ease to this otherwise complex subject. Another nice thing is that there's a box at the end of each "visit" (chapter) with the most important points discussed. It also asks you to do some homework, simple tasks that can help you materialize those concepts. For example, buying a lottery ticket to better differentiate gambling from investing. I figured that since I'm getting a bit older, I should probably have my finances in order. But it was always so daunting to get started. I don't know what I don't know. So what do I even ask about? And how then do I learn more? Low and behold the Wall Street Kitchen, with its title that just spoke to me as I happened to see it on the bookstore shelf. Victor made it really easy for a financially clueless individual such as myself to feel comfortable exploring my investment options. His content help I figured that since I'm getting a bit older, I should probably have my finances in order. But it was always so daunting to get started. I don't know what I don't know. So what do I even ask about? And how then do I learn more? Victor made it really easy for a financially clueless individual such as myself to feel comfortable exploring my investment options. His content helped me establish a knowledge base of what stocks are and how I can actually implement my new knowledge to make a positive ROI. As an added bonus, there are Victor's mom's renowned recipes at the back of the book. I tried the fried wonton recipe, and recommend it! The motherly advice and practical knowledge contained is this book isn't taught in any schools - and it SHOULD be!! Book contains slight humor presented and is an easy read, making it suitable for men and women of all ages no matter the financial background. Excellent read if you're serious about making money in stocks. 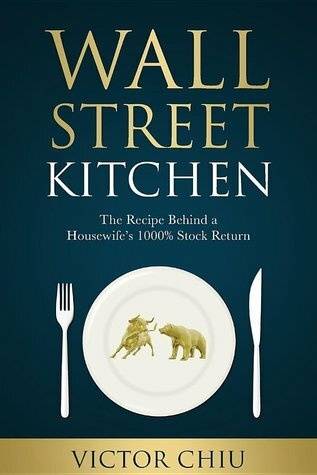 I love the author's way of telling the story, cleverly combining stock investing with yummy home cooking. Chiu quickly sets the atmosphere from the beginning by inviting you into his kitchen for some tea and snacks, then presents his information in a very logical and easy to understand way. Overall a fun book to read as it empowers all of us women to be more like Mom! Investor behavior is unpredictable and so are the markets. This book clearly demonstrates these facts and also provides constructive, yet down-to-earth solutions on tackling these uncertainties. Self-published non-Fiction books from relative unknowns have a potential credibility gap. Does this person really know what they're talking about? Of course just because a publisher decided to put a book out doesn't mean it's credible. So ultimately we're left vetting the information based on prior knowledge, common sense, comparisons to what others say on the subject, and what our “gut” tells us to think. Based on the criteria above, I found the advice given in Wall Street Kitchen to be solid. T Self-published non-Fiction books from relative unknowns have a potential credibility gap. Does this person really know what they're talking about? Of course just because a publisher decided to put a book out doesn't mean it's credible. So ultimately we're left vetting the information based on prior knowledge, common sense, comparisons to what others say on the subject, and what our “gut” tells us to think. Based on the criteria above, I found the advice given in Wall Street Kitchen to be solid. The basics agree with other investment advice I've seen from credible sources (one example being what the National Association of Investment Clubs suggests to their member clubs). It passes the common sense test for me as well. Some people will like the folksy style and it will help those readers retain the concepts better. Others won't. But the advice seems solid to me.